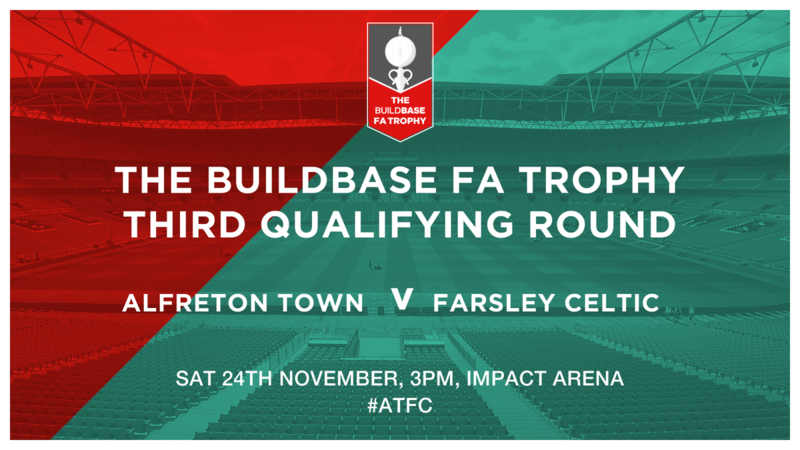 Alfreton Town move into FA Trophy action as we welcome Evo-Stik Premier Division side, Farsley Celtic; to the Impact Arena, kick off is 3pm. After a gut-wrenching defeat to Leamington in the league on Tuesday night, another reaction is needed from the Reds who were caught with a late 83rd minute winner on Tuesday, just a few minutes after levelling the contest through a Luke Shiels header. It was another set back in the league after a first league win since September in a 3-1 win against Nuneaton last Saturday, the Reds are desperately in need of consistency and have had a stop-start campaign so far with injuries and results. A win once again is on the agenda for Billy Heath who will have players returning for contention but will also be without the likes of Bobby Johnson (hamstring) and Sam Hird (knee). A return to the winning feeling will be all too familiar as Alfreton look to turn good performances into results but in turn not throw promising positions away. We head into tomorrow's contest with just one win in our last seven in all competitions but we will be looking for our second win in the last three in all competitions. We have lost two of our last six home games in all competitions and will be looking to bounce straight back from Tuesday's home defeat. Farsley Celtic sit in third place in the Evo-Stik Premier Division with 33 points from 16 games. Their current playing record stands at: P16, W10, D3, L3. Farsely arrive to us having played three games in the FA Trophy already, with a 4-1 win over Brighouse Town in the First Qualifying Round, before a Replay win over Carlton Town 0-4, in the Second Qualifying Round to set up the tie. The Celts haven't lost an away fixture since a 2-1 loss to Nantwich Town back in October, their last two results on the road saw the 0-4 success at Carlton before romping past North Ferriby in the league last Saturday 0-6, which was their last outing. Although these were our last meetings against the Celts, Farsley would withdraw from the 2009/10 Conference North Season in March 2010, after a difficult camapign which saw the club move into administration. Their league record was then erased shortly after withdrawl. This was also the same season we reached the Conference North play off final and lost out to Fleetwood Town, 2-1.